You will be excitied to find out all the great choices you have for a luxury Marco Island hotel or resort that is perfect for families and all types of travelers. For those looking for a lively resort-style atmosphere and a children’s club then the JW Marriott Marco Island Beach Resort is ideal. 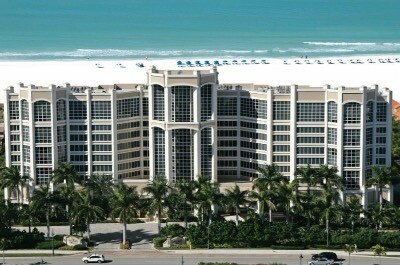 Couples looking for an upscale all-suite property with charm should stay at the Marco Beach Ocean Resort. For families that want to save money and cook some meals at home then the condominium style accommodations at the Hilton Marco Island Beach Resort, Marriott's Crystal Shores as well as the Charter Club of Marco Beach are superb and offer numerous resort style amenities onsite including a kid’s club. The JW Marriott Marco Island Beach Resort is the perfect upscale Marco Island hotel for families who want to be beachfront, have access to outside attractions and want to enjoy plenty of onsite amenities. Located along South Collier Boulevard in the west-central area of the island, the JW Marriott Marco Island Beach Resort has direct beach access and is less than 1-mile away from the Marco Island Historical Museum. The JW Marriott Marco Island Beach Resort has a modern eleven story architectural design with 732 rooms and suites that feature a recently renovated upscale interior. Rooms have 402 square feet with a choice of bedding, floor to ceiling windows and a private balcony that offers views of the island, gardens, pool and Gulf of Mexico. Corner units are sized at 410 square feet with an integrated living/sleeping area, floor to ceiling windows and two private balconies that boast views of the gulf. One-bedroom suites are 800 square feet with a choice of bedding, floor to ceiling windows, 1.5-bathrooms and a private balcony views of the gulf or poolside. 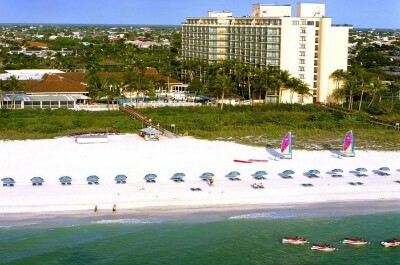 The JW Marriott Marco Island Beach Resort has a perfect spot on the beachfront where you will find plenty of sand to relax and there is a wide assortment of watersport equipment for rent onsite. The JW Marriott Marco Island Beach Resort is nearby to many attractions such as the Marco Island Center for the Arts, Briggs Nature Center and the Otter Mound Preserve. Adults and children will enjoy the scheduled resort activities that include organized events throughout the property and pool areas. The resort offers several amenities onsite such as two freshwater swimming pools that include a waterslide and splash area for children as well as drink service for adults, a fitness center, shopping boutiques and a full service spa. Dining onsite includes ten restaurants which are Cafe San Marco for all three meals; breakfast and lunch are serves at Hammock Bay Grill and Rookery Grill; lunch and dinner are prepared at the Kane Tiki Bar and Grill as well as 400 Pazzis and Quinn’s on the Beach. Dinner can be found at the Korals Sushi and Cocktail Lobby Bar as well as Ario. Nightlife includes a Polynesian show at Quinn’s on the Beach, a quiet drink beachside at sunset or at the Kane Tiki Bar and Grill. 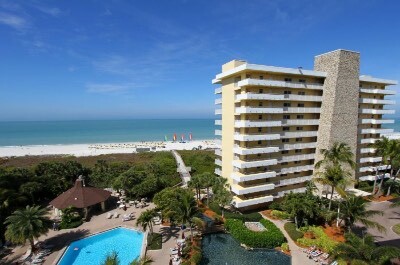 If you are interested in staying at a luxury Marco Island hotel that boasts great beach access, superb personalized service and offers all-suite accommodations then the Marco Beach Ocean Resort is ideal. Located within the central western shoreline of the island along South Collier Boulevard, the Marco Beach Ocean Resort is situated directly on the beachfront overlooking the Gulf of Mexico and is only 5-blocks away from the Isles of Capri Paddle Craft Park. The Marco Beach Ocean Resort has a modern twelve floor architectural style with Mediterranean accents that contains 93 all-suite accommodations that feature an elegant contemporary decor. One-bedroom suites are large with a separate living room that has a sofa sleeper, a full kitchen and a private balcony that boasts views of the gardens, gulf or gulf front. Two-bedroom units have a separate living room, a full kitchen, 2-bathrooms and a private balcony that sports views of the gardens, gulf or gulf front. The Marco Beach Ocean Resort is steps away from a white sand beach where you will find beach attendants offering drink service and the onsite concierges will help you arrange all of your favorite watersport adventures. The Marco Beach Ocean Resort is also close to many different attractions on the island such as the Caxambas Pass Park, Cape Romano and Captain Horr’s Pineapple Plantation. The resort boasts several onsite amenities that include a rooftop freshwater swimming pool that overlooks the Gulf of Mexico, a fitness center and there is a full service spa. Dining at the Marco Beach Ocean Resort includes a leisurely home cooked meal in your suite and you can indulge in all three meals at Saletta or the Terrace as well as dinner at Sale E Pepe. There is also pool and beach side service with food as well as cold beverages. Offsite dining within walking distance to the resort includes Maia, Ario for steaks and La Tavola prepares seafood. Nightlife includes a drink at Toulouse Lounge where you will find a relaxing atmosphere or try the Marco Island Brewery for a craft beer. When you want to find a Marco Island hotel that offers all-suite accommodations with superb onsite amenities for families and is just moments away from several attractions then the Hilton Marco Island Beach Resort is perfect. Located on South Collier Boulevard along the southwestern shoreline of the island, the Hilton Marco Island Beach Resort has a private beach that overlooks the Gulf of Mexico and is just 3-blocks from the Marco Island Center for the Arts. The Hilton Marco Island Beach Resort has a modern eleven story architectural design with 297 all-suite accommodations that feature a recently renovated contemporary interior. Junior suites are spacious with a choice of bedding, an open floorplan that includes a sofa sleeper and a private balcony that offers views of the gardens, pool, gulf or gulf front. One-bedroom suites have a separate living room with a sofa sleeper, a choice of bedding, dining area and a private balcony with gulf front or pool views (open floorplan one-bedroom suites have 1.5-bathrooms). The Hilton Marco Island Beach Resort has a nice stretch of private beach for you to lounge and there are watersport rentals available onsite. The property is minutes away from many attractions such as Mackle Park, the Marco Island Historical Museum and Tigertail Beach is only 2-miles away from the resort. The Hilton Marco Island Beach Resort has plenty of onsite amenities like scheduled events for children at the kid’s club, a freshwater swimming pool with a sundeck overlooking the Gulf of Mexico, a fitness center and a full service spa. Dining at the resort includes the Deck at 560 which serves all three meals, 560 MKT prepares quick bites and you can enjoy beach as well as poolside service from the Gulf Cart. Offsite dining options within a short distance include Marco Prime Steaks and Seafood, the Oyster Society and DaVinci’s serves Italian cuisine. Nightlife includes movie nights for the kid’s, a quiet sunset drink at 560 Bar or you can venture to Quinn’s on the Beach for live entertainment. The Marriott’s Crystal Shores is an upscale Marco Island hotel that offers all condominium accommodations for families, has great beach access and boasts several activities onsite for all age groups. Located on South Collier Boulevard along the southwestern coastline of the island, the Marriott’s Crystal Shores overlooks the Gulf of Mexico directly on a section of private beach and is 1-block from the Isles of Capri Paddle Craft Park. The Marriott’s Crystal Shores has a modern fourteen floor architectural style with 219 condominiums that boast an upscale trendy decor. Two-bedroom units range in size from 1,105 to 1,330 square feet with various floorplans which include a separate living room, full kitchen, 2-bathrooms dining area and a two balconies that offers a coastal, gulf or a gulf front view. Three-bedroom condominiums are between 1,480 to 1,710 square feet with varying layouts that include a separate living room, dining area, full kitchen, 3-bathrooms and two balconies with enlarged living areas that boast views of the coast, gulf, pool or gulf front. The Marriott’s Crystal Shores has a great place on Marco Beach where you will find plenty of space to relax and there are plenty of watersport opportunities available through nearby vendors. The property is close to numerous attractions which include the Marco Island Historical Museum, Mackle Park and Briggs Nature Center. The Marriott’s Crystal Shores offers scheduled activities for adults and there is a supervised kid’s center with organized events for children. The resort has two nice freshwater swimming pools including a zero entry pool as well as the Grotto pool which has a waterslide and there is a fitness center. Dining onsite includes a home cooked meal in your villa and there is the Stilts Beachside Bar and Grill for all three meals. Offsite dining options within a short distance of the property includes Sale E Pepe for Italian dishes, Quinn’s on the Beach serves seafood and Ario prepares steaks. Nightlife includes a quiet walk on the beach, kids can enjoy free supervised movies or you can venture to Marco Golf and Garden as well as Off the Hook Comedy Club for evening fun. If you are interested in finding a mid-range Marco Island hotel that offers condominium style accommodations, lots of amenities onsite and is ideal for families then you should try the Charter Club of Marco Beach. Located on the southwestern shoreline of the island along South Collier Boulevard, the Charter Club of Marco Beach is situated directly on Marco Beach overlooking the Gulf of Mexico and is just over 1-mile away from the Marco Island Historical Museum. 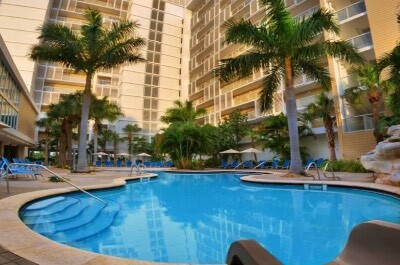 The Charter Club of Marco Beach has a modern ten story architectural design with 80 two-bedroom condominiums that feature a contemporary interior. The two-bedroom condominiums are spacious with a separate living room, dining room, a full kitchen, 2-bathrooms and a large private balcony that overlooks the Gulf of Mexico. The Charter Club of Marco Beach has a perfect spot on the beachfront where you can lounge, swim and there is watersport equipment for rent onsite. The property offers supervised activities for adults and children during the day within the resort. The Charter Club of Marco Beach is nearby to many attractions such as the Marco Island Center for the Arts, Isles of Capri Paddle Craft Park and Caxambas Pass Park. The Charter Club of Marco Beach has numerous onsite amenities that include a freshwater swimming pool that includes poolside barbeque grills as well as a children’s swimming pool, a fitness center, tennis courts, bocce ball and shuffle board. Dining at the Charter Club of Marco Beach starts with a leisurely home cooked meal in your condo and there are several eateries nearby such as La Tavola for seafood, DaVinci’s prepares Italian as well as Marco Prime Steakhouse and Seafood. Nightlife includes a quiet walk on the beach at sunset or you can take the family to watch a show at the Marco Movie Theatres which are within walking distance.